STOVE TOP makes this delicious pot pie easy for any night of the week. 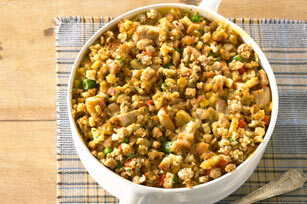 Combine chicken and vegetables in 2.5-L casserole dish. Mix soup and milk; pour over chicken mixture. Top with stuffing. Bake 30 min. or until hot and bubbly. Assemble pot pie in 2.5-L microwaveable casserole dish; cover with lid. Microwave on HIGH 10 min. or until chicken mixture begins to bubble, rotating dish after 4 min.